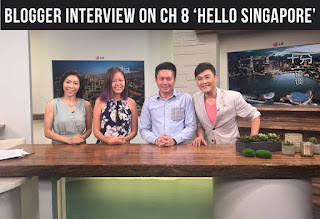 Was invited by Jess the Collie last year around after Christmas to drop by the Prince of Wales to try out their Australian kitchens at both PoWs at Little India and Boat Quay. Well, I finally had the chance to go there last Thursday to try it out, and I was so psyched because it is the first time someone's inviting me to go try their food. Thus this review of Prince of Wales Counter Meals! So I asked a few of my friends and my sister to go along as well. On a Thursday at 8pm, the place was quite empty, it being a weekday and all. 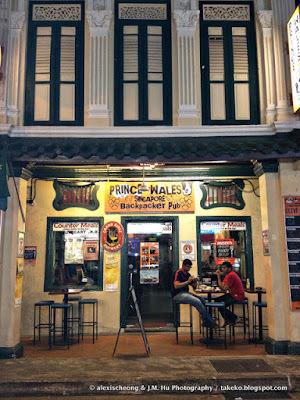 I've actually been to the Prince of Wales quite a few times before in the past for drinks, but never realized that they have a kitchen or restaurant as I've always thought there's just a pub out back of the really cool backpackers' hostel! Yes, for $22 a night you get to stay at this really awesome backpackers' hostel. All photographs on this post were also kindly taken by J.M. Hu with his DSLR. 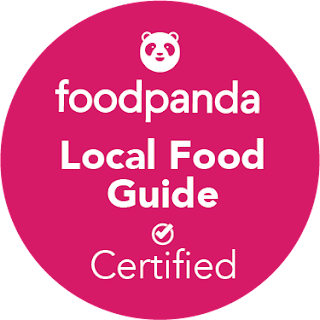 The ambiance of the place is really great because it's totally casual and being in the heart of little India also smacks of indie cool. There's just this vibe about the place that makes you feel relaxed. 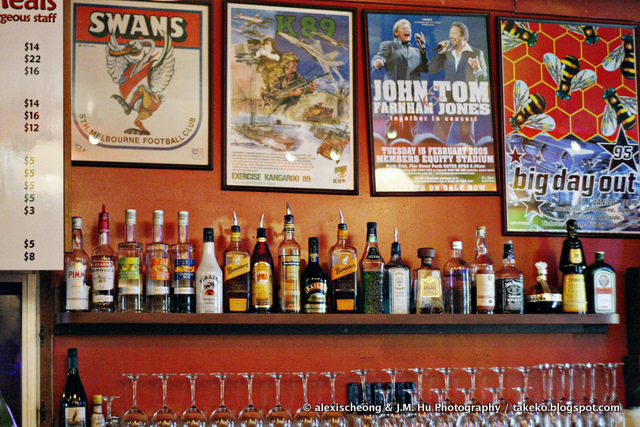 The walls are also filled with soccer and jagermeister memorabilia -- apparently they are really big on the jager parties, so jager fans you know where to head to next time! Their menu is really quite extensive for such a small place, but luckily Neil was around to give us some recommendations. 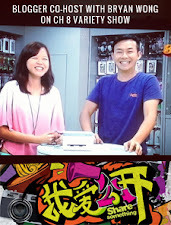 It's a pity their masterchef was on leave for Chinese New Year so another chef and his assistant did the cooking. It was quite a bit of a wait for the food, but since we ordered 5 mains and a starter, it's quite understandable. Would be good if the starter salad was served first though, because one of my friend was absolutely starving while we were waiting for the food. On to the food items! 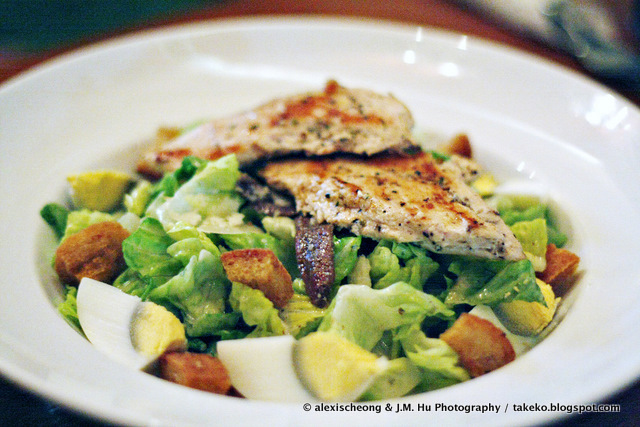 First up, the Chicken Caesar Salad ($15). It's quite nicely done, but I find the greens a little bit watery, so it wasn't as crispy as I like. However the sauce is quite light unlike the usual caesar salad dressing, and there were bacon bits inside as well. 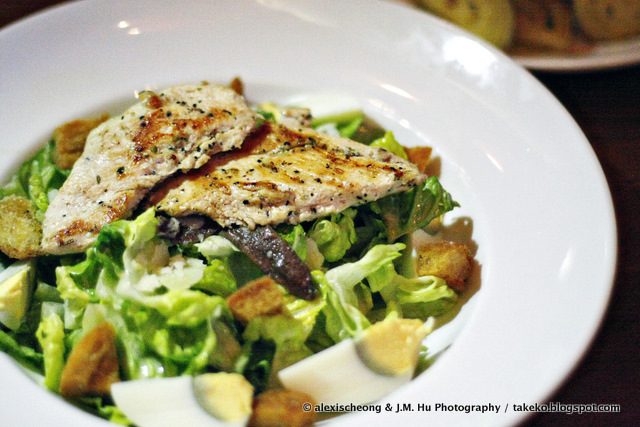 The chicken breast meat on top was also a surprise since most times they do cubes or shreds. Very substantial. Then came the funny part. So all 4 of them have an iPhone 4/4s, and since the area was quite dimly lit, they started taking out their iPhone flash to shine on the food, so the camera can take better shots. Must have looked quite comical with 2 iPhone being held as light stands as JM was taking the photos! But they turned out well and has quite a 'superstar' effect to them. I hope these make you hungry! 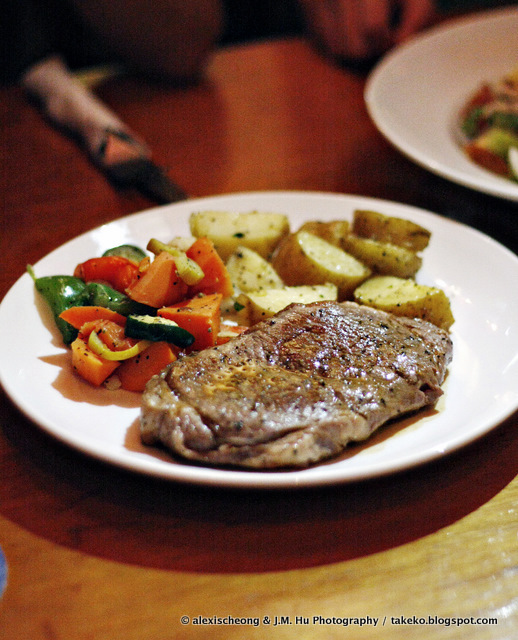 We also ordered a porterhouse steak ($24). It was quite juicy, but there are quite a few bits of tendon inside that might make people with braces have a problem with it. Would also have loved it if there was more gravy or sauce on it, but overall a good set of steak with potatoes. 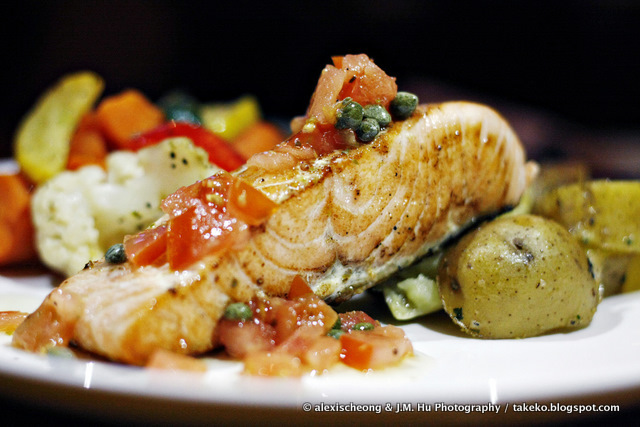 Next, the grilled salmon ($20)! Are you ready to salivate??? 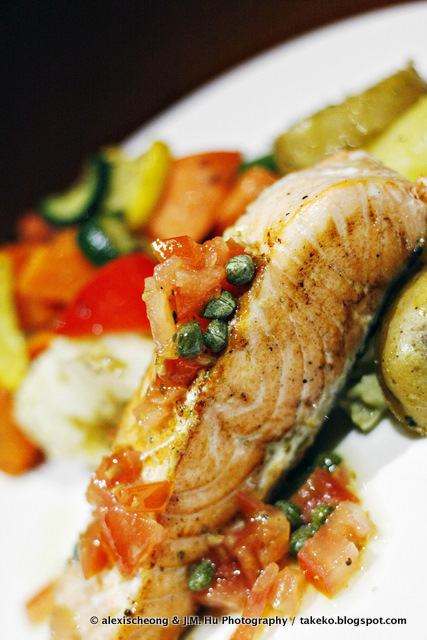 We really enjoyed this set because the salmon was really done to perfection, very fresh and just the right amount of time on the pan, before being garnished with tangy tomato sauce. I would recommend this if you don't want to have that heavy a meal, but still a satisfying and omega-3 loaded on. Imagine this to be very popular among the ladies. YUM! Next up, the most disappointing dish of the lot, the bbq pork ribs ($22). Well, Neil didn't exactly recommend this, so I supposed we should have listened! 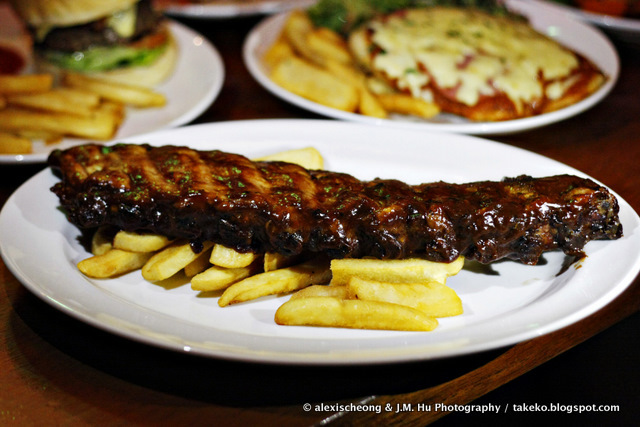 The ribs were really tough, so there wasn't much to be said for it, though the barbecue sauce was flavoured nicely. The thick-cut fries made up for it a bit though cos they were so delicious! Everyone kept going at them. Next up, the PoW beef burger ($16)! Star item on the menu, there is a reason why. The reason is because the meat patty is just unbelievably juicy and THICK. It's almost like having another steak, but this time in mashed format. Can you imagine how shiok it will be to have this after a long day, with a beer beside? Chow time! 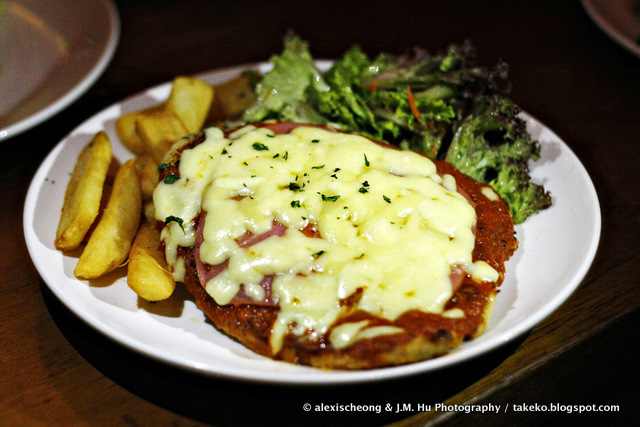 And lastly, for the Most Popular item of that night among the 5 mains - the Chicken Parmigiana ($18)! It was highly recommended by Neil and I can see why! It was a huge portion too, so 2 people can share this and get a side and be done with lunch, maybe. 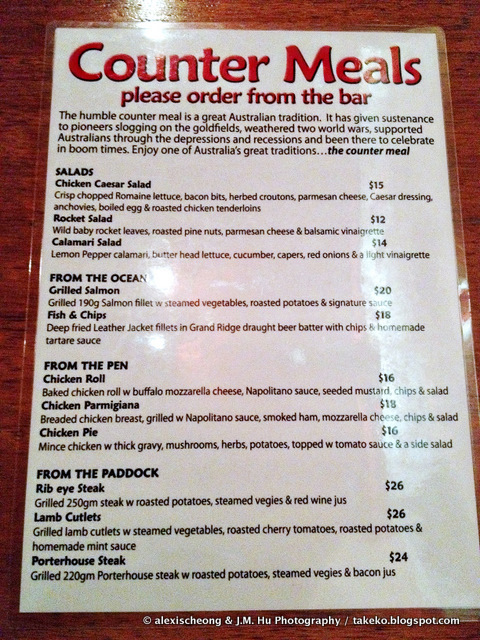 I've never had a chicken parma before. Allrecipes.com described it as "Mozzarella and Parmesan melt over breaded chicken swimming in spaghetti sauce in this timeless Italian classic." The breaded chicken covered in cheese and ham was really a surprise. The chicken was really tender even though it had to be breast meat. Coupled with the tangy tomato sauce and the melted cheese on top of the ham that lent a strong supporting hand in giving it a more 3 dimensional flavour, this was like a meat pizza almost! It's also very easy to eat and share. 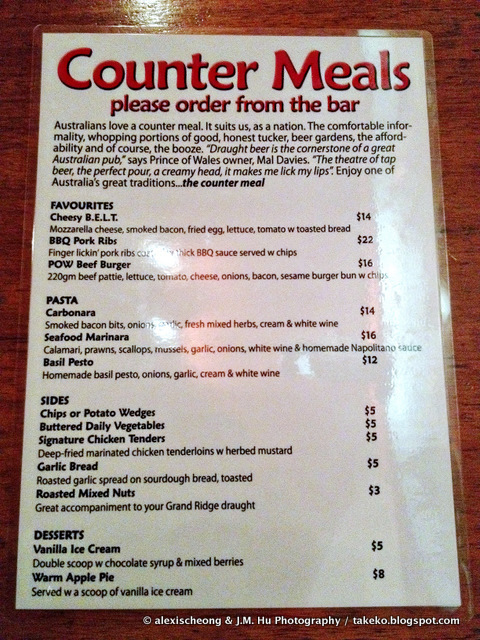 I would recommend this if you are at PoW and can only order 1 item off the menu. Overall I really enjoyed our dinner at PoW. 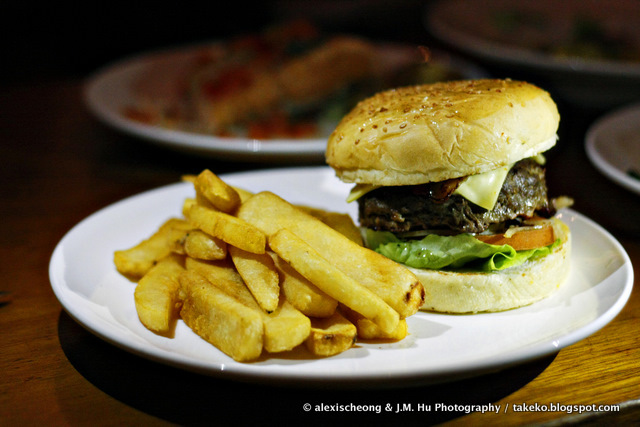 It is an unpretentious pub and restaurant that serves up good ol' comfort food in the form of western classics. Their fries will be very good with the beers, which they also have good promotions for. 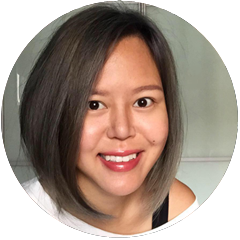 Think of PoW next time you are around the area, maybe at dhoby ghaut, and want to have a late night dinner and some drinks. There's also a guy singer at 9pm while we were there crooning popular songs so that was a nice touch to liven up the place. While you are there, say hi to Jess the collie if she is around, the 7.5 year old mascot for this 7.5 year old joint! Also, a little bit of trivia - this place is called Prince of Wales because it was one of the pub names in Melbourne, where the owner is from. 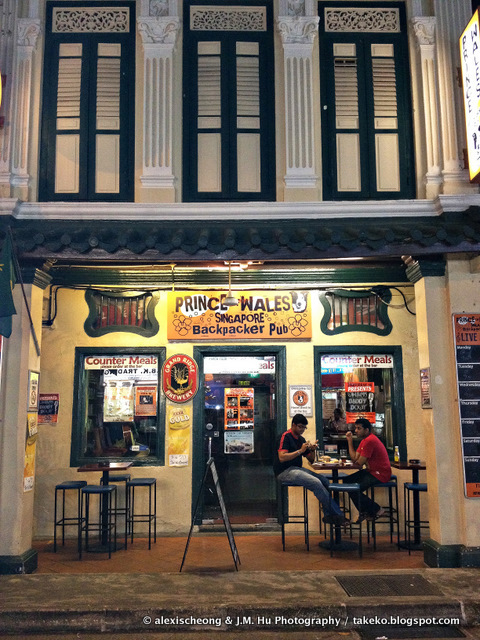 And since a lot of pubs there are named after British establishments/culture, Prince of Wales is one of them. Thanks, Prince of Wales for the invite and generosity!